A dental abscess is an aggregation of pus in the mouth and is a sign of bacterial infection. If you have a dental infection you will often notice or feel a swelling in the mouth which can be hard or soft. An abscess or infection can occur for a number of reasons. For instance a patient with advanced gum disease can develop a small gum boil adjacent to an affected tooth which is a sign of a periodontal infection. These can sometimes be treated with anti-biotics alone but in many cases the patient with require deep gum cleaning in this area to solve the problem. Wisdom teeth are another common source of dental infection. Please see the section about wisdom teeth in the 'I'm in pain/discomfort menu'. The most common type of dental abscess is caused by a 'dead tooth' becoming infected. A tooth may lose vitality for different reasons but the most common ways are through trauma or if a tooth develops a large cavity which exposes and infects the nerve of the tooth. In some instances a tooth with a very deep filling will lose vitality and will become infected. The only way to save an infected/dead tooth is via root canal treatment. 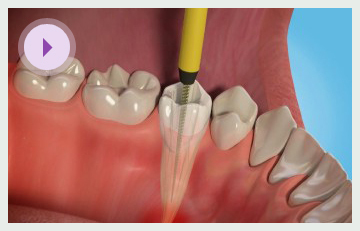 The alternative to Root canal treatment is to extract the infected tooth. Please see below for more information on root canal treatment. 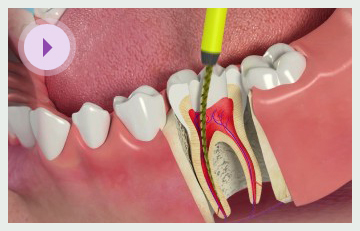 Root canal treatment is carried out when the pulp (or nerve) inside the tooth is damaged or becomes infected. If an infected pulp is not treated, it may develop into an abscess. If the nerve inside a tooth dies off bacteria which live in the mouth can sometimes invade the tooth. The bacteria then feed on the dead nerve tissue within the tooth and this can lead to a dental infection. This often leads to pain as bacterial toxins can leak into the bone around the tooth making the tooth painful to bite on. In many cases a swelling will be seen on the gum adjacent to the tooth as and this is called an abscess. Root canal treatment is the only way to treat this type of infection. This is a process whereby the infection is drained out via the root canal system (the hollow part of tooth which sits in the jaw bone), as this is where the bacteria aggregate when an abscess forms The dentist will numb the tooth and often places a small rubber sheet – known as rubber dam – around the tooth to stop anything from falling to the back of the mouth and to prevent bacteria which live in saliva from entering the root canal. They will then remove the damaged tissue and bacteria inside the tooth and make the root canal as clean as possible. Once it is clean, it is filled with a special material so that bacteria cannot re-enter. Finally, a permanent filling is placed to seal up the tooth. The dentist is likely to take x-rays before, during and after the treatment. This will allow the dentist to assess the number of roots the tooth has, the shape of the root canals, the length of the root canals etc. X-rays after treatment are done to confirm that the root canal has been adequately filled. A tooth may have several root canals. It takes time to find them and clean them out thoroughly. So, it might take one or more visits to complete the treatment, depending on the tooth. If more than one visit is needed, the tooth will have a temporary filling placed in it until the next appointment. Sometimes a dead tooth causes no pain and is discovered by chance. It may be possible to leave the tooth until it causes problems, although if an infection is left to grow it can become more difficult to the treat. Root canal treatment does not always work although it is generally successful. Root canal treatment may fail due for a number of reasons. Sometimes, removing the old root filling and replacing it with a new one will solve the problem. At other times, it may be more sensible to extract the tooth. A root-filled tooth often needs to be fitted with a crown (cap) to protect it from fracturing as root filled teeth tend to be brittle. Once the root canal filling has been completed successfully, the tooth can remain in function for many years.